Where Are the Young People in Wilderness? Concerns about how to engage young people to maintain the relevance of wilderness over the next 50 years were common at the 2014 National Wilderness Conference and have arisen in many of our university classroom discussions and personal conversations with federal agency staff. Worries that many young people no longer recreate in wilderness, experience wilderness more quickly and with more technology than previous generations, are not involved in wilderness stewardship, or will somehow drop the ball in the coming decades seem to be increasingly prevalent. As young people engaged in wilderness stewardship ourselves, we would like to counter some of these concerns by demonstrating that there are many of us who find wilderness highly relevant and would like to get involved in wilderness stewardship but are encountering numerous barriers to doing so. We present one model for engaging smart, motivated young people in wilderness management, and discuss what we believe are key characteristics and practices for the next generation of wilderness leaders. There certainly is something to the idea that exposure to wild places breeds a love for them, as famously described by Richard Louv in Last Child in the Woods (2008), and our population is indeed urbanizing (National Parks Second Century Commission 2009). But a childhood filled with wilderness experiences is not necessarily a prerequisite for raising a wilderness steward. In fact, neither of us grew up with much exposure to wilderness or public lands. Christina grew up in Charlotte, North Carolina, a southeastern metropolitan area of more than 2 million people. Monica, first generation Indian American, was raised in the densely populated state of New Jersey. Neither of us grew up camping, and neither of our families took summer road trips to national parks. 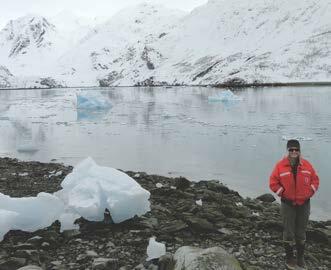 Despite our urbanized upbringings, we both developed a deep connection to wild places, a connection strong enough to catalyze careers in wilderness and public lands. We just needed a vehicle that allowed us to convert that connection into a viable professional pursuit. For us, it was through the Wilderness Fellows Program. The Wilderness Fellows Program was created in 2010 with funding from the National Park Service to advance wilderness stewardship while providing young professionals and recent college graduates an opportunity to gain valuable career experience. The program expanded to include the US Fish and Wildlife Service and the US Forest Service so that over the next five years, 50 wilderness fellows would provide on-the-ground sup-port to help staff integrate wilderness character into monitoring, planning, and management. For each wilderness area, fellows collect and compile data to produce baseline assessments for local wilderness character that address the special and unique qualities of each wilderness and assist staff in a variety of ways to improve wilderness stewardship, such as con-ducting staff training or developing a multi-agency database (Figure 1). Islands National Seashore. Photo by Bill Crouch, USFWS. Another goal of the Wilderness Fellows Program was to recruit bright young minds to field-test the inter-agency wilderness character framework, Keeping it Wild (Landres et al. 2008). With this direct contact between national-level wilderness managers and wilderness character monitoring in the field, the national wilderness leads interested in institutionalizing wilderness character were able to get a pulse on what was working on the ground and what needed revisiting. This rare direct connection informed wilderness policy guidance, handbooks for the field, and led to more effective practices in wilderness areas themselves. The Wilderness Fellows Program had a positive impact system-wide. It started a subtle for-ward movement, bringing agency staff at all levels and across disciplines to the table for the exchanging of ideas and perspectives. By the end of 2014 and the mark of the 50th anniversary, the US Fish & Wildlife Service had completed wilderness character assessments for all 64 wilderness refuges, the National Park Service had assessed wilderness character for 9 wildernesses, and the Forest Service had completed assessments for 5 wildernesses. The 2015 wilderness fellows have been incorporating wilderness character monitoring data into a multi-agency database and updating wilderness character measures based on lessons learned in the field. Another result has been the immeasurable benefit of introducing 50 young professionals as wilderness fellows to potential careers in wilderness stewardship. In addition to the on-the-ground impact, our involvement in the wilderness fellows program built the foundation of personal relationships with wilderness that inspired both of us to pursue careers in wilderness stewardship and public land management. It afforded us the rare opportunity as fellows to participate in management team meetings, work with agency staff across divisions, foster connections with future mentors, and opened numerous doors within the agencies. Over the past few years, we have received dozens of inquiries from our peers asking, “How do I get your job?” or “How do I land a career in wilderness stewardship?” Some are peers from college or graduate school, yet many are peers from our hometowns: intelligent, urban, young people looking for something meaningful. They are often discouraged by their attempts to apply for jobs in conservation, having hit barrier after barrier. They are frustrated by multiple rejections from the federal hiring system and the mystery of applying as someone without knowledge of how the hiring system works. While there are many young people and recent graduates who would love to take a National Outdoor Leader-ship School course, volunteer, or apply for a summer internship, student loans have often meant they cannot afford expensive programs, unpaid intern-ships, or minimal stipends. To get young people involved in wilderness stewardship, we need more programs that are both financially supportive and provide leadership skills and meaningful networking rather than manual labor alone. Meaningful networking is important. We are both fortunate to have positions with the National Park Service today because we have been inspired by some great wilderness leaders before us. For each of us, there have been at least four or five people who have opened doors and who have become our champions and advocates. These people created a space through genuine interest in the next generation with the foresight to recognize a need to inspire the future stewards of wilderness. They did this in part by relaxing the hierarchical structure within these agencies to directly interface with youth who would otherwise not be able to engage in meaningful conversations with wilderness managers. Our own experiences, contrasted with the frustrations expressed by our peers, have made us firm believers in the power of mentorship, and it is programs such as Wilderness Fellows that are so critical for creating the opportunity to build those relationships. After these initial connections are made comes the equally difficult task of moving from a fellowship position to a federal position within the agency. In the field of wilderness stewardship and in some other agency directorates, there can be missing bridges between a fellow-ship, internship, or entry-level and management-level positions. As David Cole notes in the April 2015 issue of this journal, “Investments in training and experiential knowledge are lost as wilderness stewards leave their jobs in order to be promoted, and those in wilderness leadership positions lack extensive wilderness experience” (Cole 2015). One possible way to address this would be to formalize more entry- and mid-level wilderness roles into the hiring system. By highlighting the intersection with wilderness in relevant job announcements, those interested in a career in wilderness may be able to more easily navigate the often-cumbersome federal job search. For example, positions reflecting wilderness stewardship responsibilities in job titles or position descriptions (e.g., wilderness interpretive ranger or wilderness facilities specialist) are easily recognizable and could help young people transition into a career while demonstrating the interdisciplinary nature of wilderness management. Furthermore, championing the inter-agency wilderness program as a funding priority cannot be ignored as an important part of the solution. We’ve both spoken to count-less young people who are very interested in a career in wilderness stewardship, so to Tweed’s speculation that wilderness recreation is something our parents did and is therefore something in which our generation will not participate, we say, not necessarily. The wilderness leaders of the future are out there; they’re just looking for a way in. In fact, the number of potential wilderness leaders is likely growing – to the extent that protected and wilderness areas can increase their relevance and accessibility to more diverse populations, the greater the potential for new leaders. So who are these new wilderness leaders? What skills will it take to manage wilderness in an era of rapidly changing demographics and technol-ogy, in which our understanding of the complexity and uncertainty in our social and ecological environment is greater than ever? There isn’t an easy answer to these questions, but what we do know is that the wilderness leaders of tomorrow will need to be able to communicate and manage at broader scales. They will need to think systemically and work across disciplines. As we grapple with tough issues such as climate change, we will need to balance the need for science and new technology with humility and restraint (Figure 2). The next generation of wilderness leaders and public land managers will need to incorporate more social science because resource management is often about understanding social and political forces at play, on a variety of different scales. We need to invest in under-standing people’s values, motivations, and relationships with wilderness, especially as climate change causes us to reflect on a number of possible futures that may look very different from the past. Figure 2 – Exploring the Glacier Bay Wilderness, Glacier Bay National Park. The next generation of wilderness leaders will have to build bridges across disciplines and divisions. Within parks, forests, and refuges, it becomes increasingly important for staff to make the connection to the ways in which their job impacts wilderness, not how wilderness impacts or limits their job. By cultivating a wilderness ethic within agencies, or even within one’s park, forest, or refuge, staff will better understand their role in preserving wilderness and be able to integrate a consciousness into operations occurring or impacting it. One way that units with wilderness have successfully done this is by hosting a wilderness fellow. Wilderness professionals will have to balance being bold and respectful. At times it takes listening to others’ perspectives in order to be heard in return. A healthy and thoughtful dialogue around stewarding wilderness in a changing world is important. Other times, informed boldness is warranted when situations arise that boil down to a decision compromising the spirit of wilderness. In these moments, some-one needs to hold the line and be a voice, an advocate for wilderness. Importantly, tomorrow’s leaders will need to carry on the spirit of mentorship from which they benefited. We can, however, start today. So think of that person that helped you get where you are today and strengthened your relationship with wilderness, and pay it forward. For more information about the Wilderness Fellows Program, contact Nancy Roeper (nancy_roeper@fws.gov). CHRISTINA MILLS is an outdoor recreation planner at Yellowstone National Park in Mammoth Hot Springs, WY; email: Christina_Mills@nps.gov. 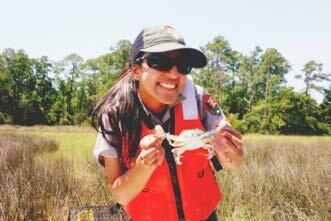 MONICA PATEL is a wilderness and backcountry planner at Gulf Islands National Seashore in Ocean Springs, MS; email: monicapatel84@gmail.com. Cole, D. 2015. Perspectives from the Society for Wilderness Stewardship: Enhancing the professionalism of wilderness stewardship? International Journal of Wilderness 21(1): 28. Louv, R. 2008. Last Child in the Woods. Chapel Hill, NC: Algonquin Books. National Parks Second Century Commission. 2009. Connecting People and Parks Committee Report. Retrieved from http://www.npca.org/assets/pdf/Committee_ People_and_Parks. PDF. Tweed, W. C. 2010. Uncertain Path: A Search for the Future of National Parks. Berkeley and Los Angeles, CA: University of California Press.